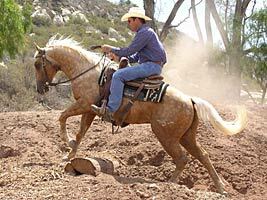 Check out our Performance Horse Training Schools Here! I try to strike a balance with between arena time and outside trail riding. This month I would like to share with you the progress of “Rocky,” our two year old quarter horse stallion that is destined to be a reined cow horse. I want to step outside the strict regiment of what it takes to be a world class performance horse. As I attempt to train the “whole” horse I want to show you how some extracurricular activities can make any performance horse a more well rounded equine citizen. Many performance horse training programs consist solely of saddling at the barn, working in the arena, and then back to the barn. One trainer was asked, “Do you ever ride your horses out of the arena?” His reply was, “I’m not going to show them outside the arena. Why should I ride them outside?” I understand the predicament of some trainers. Perhaps there is simply no access to trails or outside country adjacent to their facility. And for others, there simply isn’t the time. There are too many horses to train and not enough hours in the day. It’s a matter of logistics and economics. However, I don’t believe there are too many trainers who would argue that some outside, real world riding, and exposure would be anything other than a positive experience. We’re blessed here at our facility at The Thacher School in Ojai, Calif. to have a million-acre backyard. Right behind our barn is the Los Padres National Forest. The country can be rough, steep, and full of brush. Your horse had better be looking where his feet are or you both might end up in a big pile at the bottom of the mountain. As with all of my colts, I try to strike a balance with Rocky between serious and precise arena time and outside trail riding. When he has to pick his way up a rocky trail or step through a small creek, he learns to “think down to his feet,” paying attention to where he is at and where he is going. These are valuable lessons. 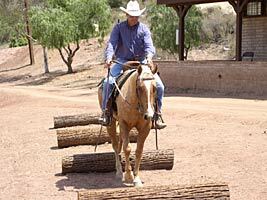 Helping your young horse become confident out on the trail is no different than any other training scenario. We’d all love to have a safe and confident mount that could pick their way down through the Grand Canyon with fire works in front of them and a marching band behind. Yet, it’s not reasonable to present that scenario to them the first day. Whether it’s sliding to a stop, working a cow, or negotiating a trail, little by little we work to build their confidence, not shatter it. Start off with trails and obstacles that your colt can handle. Remember, it’s not your colt’s responsibility to support you through the situation. It’s your job to be the leader and to be brave for them. There will be a time when you’ll approach a spot on the trail or an obstacle and your colt is going to say, “I can’t do this, I should go back; or maybe go around.” In these situations you need to be a strong, brave leader. Your colt doesn’t need to be punished. What he needs is consistent support and direction. There are really only six things he can do: he can go forward, backward, left, right, up, and down. It’s your job to have five of those doors completely closed and one door swung wide open that your colt can step through. That’s why “focus” is so important. I often tell my students, “Look where you want to go and the horse will take you there.” Look out beyond your horse’s ears. Don’t allow your colt to whirl around in circles. If that happens I guarantee that you’ve lost your focus. If my colt were to whirl off to the left I immediately rein him back to the right. If he attempts to avoid an obstacle by spinning to the right, I would instantly direct him back to the left. Here is a good principal: always go back the way you came. By immediately refocusing on the correct direction you will be reinforcing the idea of one door being open and five doors being closed. Now, all of my proceeding remarks are contingent on the idea that you didn’t put your colt in an overwhelming situation that he just can’t mentally work through. That’s what leadership is all about: presenting challenges without being overwhelming. Consistency is the tool of learning, yet variety is the spice of life. Too much consistency is too boring. Too much variety is inconsistent. Rocky has a long way to go. A little “extra-curricular” activity will help him stay fit mentally and maintain his emotional equilibrium during the long journey ahead. 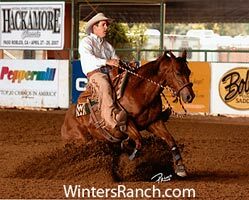 For nearly three decades Richard Winters has dedicated himself to honing his horsemanship skills and to passing this knowledge onto others. His has started hundreds of horses that have gone onto almost every equine discipline imaginable. 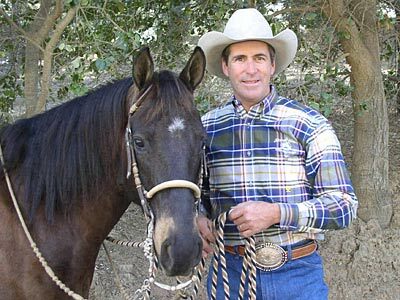 Richard’s credentials extend from the rodeo arena and high dessert ranches of the west to the highly sought after horsemanship clinician that he is today. Richard continues to expand his horsemanship experience with the National Reined Cow Horse Association as an A rated judge and avid competitor with World Championship Titles to his credit. 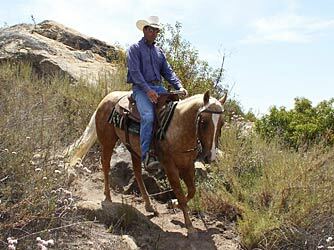 Richard along with his wife Cheryl and their children Joseph and Sarah operate their horsemanship center from the historic and prestigious Thacher School in Ojai, California. 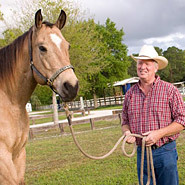 Richard’s horsemanship show can be seen 4 times weekly on DishNetwork’s University House Channel 9411. 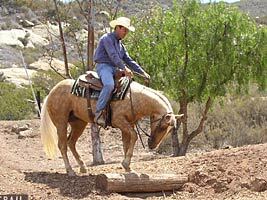 For further information please contact www.wintersranch.com or call us direct at 805-640-0956. Richard Winters Schedule of Events! Need a gift for your horse family member, friend or yourself? Check out our store for training videos you will watch over and over again and much more!